Roger Curzon is one of the UK's real hidden treasures in card magic. A creative mind like no other, Roger over the years has blown the minds of fellow magicians time and time again. 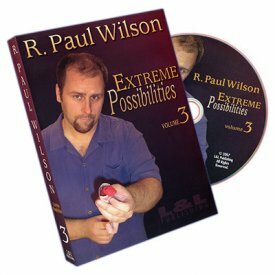 This second volume includes more unbelievable routines from this master, accompanied and introduced by Matthew Johnson, this volume is filmed in a more 'fly on the wall' approach looking into a private card lesson with Roger and Matthew. Along with Roger's original material there is also his own take on some of the classics from past masters of magic! Any one of these effects is worth the price of this DVD Set! Stabtastic - an awesome stabbing effect! Trico - magician lays 3 cards out onto the table from one deck, the spectator has another deck and pulls out 3 random cards and of course they match the 3 cards the magician laid out. Sheffield Solution - the spectator thinks of a card from half a deck, the two half decks are weaved through each other one half face up, one half face down, the only card left face down in the face up deck is the spectator's thought of card. The thought of card is never called out by the spectator until the card is revealed! Diamond Cut Diamond - Ace through ten of diamonds is on top of the deck, a freely selected card is lost in the deck, the spectator calls out a number between one and ten, suddenly their card jumps immediately into that position. Flim Flam - a sucker trick you keep for the 'difficult' spectators. Bandwich Without Gimmick - a great way to perform an impromptu Bandwich without any gimmicks! Fantastic Prediction - a card is freely selected from a blue deck, the magician spreads out his red deck and there is one green backed card amongst all the red backed cards, he turns it over and it matches the freely selected card. Card School - a prank for other skilled magicians, a devious way to stop them being able to shuffle a pack of cards! Your Thoughts Are With Me - the deck is fanned out and a card is thought of by the spectator, the magician can instantly say the card they are thinking of! Demonstration of Card Control - a way to deal yourself and your spectator a perfect hand, from a thoroughly mixed deck! One Handed Shuffle Stab - a card is stabbed into the deck during a one handed shuffle right next to the chosen card! Uncle Isaac's Numerological Prediction - a great prediction effect with a bizzare theme. It Can't be 'Made Difficult' - Two decks - a spectator thoroughly shuffles one of the decks, a number from 1-52 is called out by the spectator (e.g. 19) and the cards are dealt to that number and the 19th card is put to one side. The spectator picks up the other deck which is never touched and deals to the 19th card and the cards match... this is a clever and very direct variation of a type of ACAAN. Heavy Breather - a card is literally thrown into the deck and it just happens to land right next to the spectator's card! Simply enter your details below and we will send you an e-mail when “Blood On The Tricks Vol. 2 (2 DVD Set) by Roger Curzon - DVD” is available to ship!